Christmas is almost here - my decorations have been up since Thanksgiving. I figure if I have to go through all that effort to put them up, I want them up a good long time. I love vintage holiday stuff, especially linens and old glass ornaments - Shiny Brite and the like. I also have a bunch of little holiday gewgaws that only see the light of day for a scant month, then back into the garage they go. 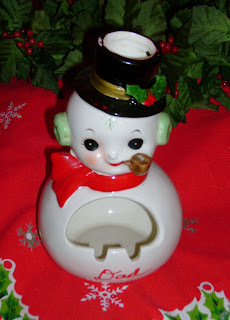 I just found this little ceramic snowman ashtray, a very practical gift for dear, old, nicotine-addicted 'Dad'. His pipe and top hat have holes to allow for the smoke to waft through. 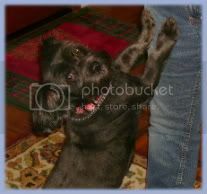 It's hard for me to picture this cute little guy stuffed with a bunch of old butts.